At Mailbox Works you’ll find a huge selection of mailboxes for sale including a full line of USPS approved commercial mailboxes by Auth Florence Manufacturing. For sending and receiving mail and small packages safely and securely, take a look at these commercial mailbox products. Designed for outdoor use, these locking CBU mailboxes are USPS approved commercial mailboxes manufactured by Auth Florence Manufacturing. CBU cluster box units are ideal for areas that require secure centralized mail delivery systems such as multi-unit residential complexes. To further combat vandalism and mail theft, we also carry reinforced, high-security commercial mailboxes that are vandal proof. If your project is a multi-tenant building or apartment complex, you can either purchase private distribution commercial mailboxes or USPS approved commercial mailboxes for postal distribution including horizontal and 4C-STD horizontal commercial mailboxes. 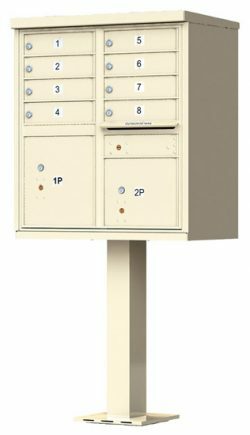 These vertical commercial mailboxes by Auth Florence Manufacturing can be utilized in apartment complexes and multi-tenant buildings but USPS has only approved them for replacement use. All new construction projects and any projects undergoing major renovations that require USPS approved commercial mailboxes must use Florence 4C commercial mailboxes. MailboxWorks carries both front loading and rear loading 4C commercial mailboxes. Most colleges, universities and educational institutions need a private use, multi-unit commercial mailbox system. Along with trash and recycling bins, mini-storage lockers, and drop collection boxes, the secure USPS approved commercial mailboxes we carry suitable for colleges and universities include standard horizontal mailboxes for private use, 4C commercial mailboxes for private use, and CBU cluster box units. Many commercial businesses, government buildings, educational facilities and industrial complexes now have restrictions on cell phone use. Commercial cell phone storage lockers are available as front loading or rear loading units and provide a secure safe system for storing cell phones and other electronic devices as well as small items like keys and wallets. Military installations also use cell phone storage lockers. Along with USPS approved commercial mailboxes, the MailboxWorks also carries a selection of secure commercial drop boxes and collection boxes. Our products include bundled door mail collection units, wall mounted collection boxes, post mount locking drop boxes, rear access drop boxes, and front access drop boxes. Buy your commercial key keepers or locking key cabinets online at MailboxWorks. 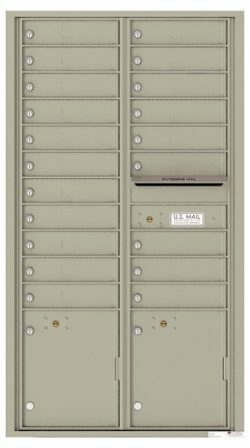 Key keepers and key cabinets are ideal for property managers and provide a secure method for mail carriers to access your building to deliver the mail. For help deciding the type of USPS approved commercial mailboxes you may need for your project, talk to one of our commercial mailbox experts. Call MailboxWorks toll-free at 1-866-717-4943.